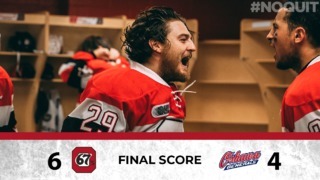 Sasha Chmelevski and Tye Felhaber each scored twice as the Ottawa 67’s cruised to their eighth-straight win with a 6-1 decision against the Niagara IceDogs on Saturday night. Marco Rossi had four assists while Kyle Maksimovich, fresh off scoring the overtime winner on Friday night, and Graeme Clarke, also scored for Ottawa in the win. Mikey DiPietro made 25 saves to pick up his second win in as many nights. Jack Studnicka picked up the only goal for Niagara, while Stephen Dhillon made 34 saves in the loss. 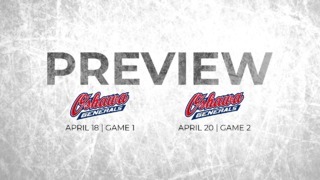 The 67’s are back in action starting Thursday when they kick off a stretch of three road games in three days, stopping in Peterborough, Mississauga and Hamilton. Felhaber led the 67’s with six shots in the game. Graeme Clarke was close behind with five shots on goal. 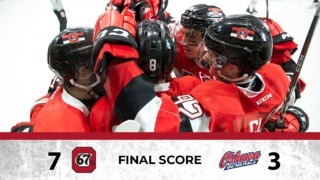 The 67’s had success on the powerplay on Saturday, going 3-for-8. The 67’s had a 43-28 edge in the face-off circle against Niagara. The 67’s scored 17 goals in their three games this last week, all wins. Maksimovich is now on a six-game point street, while Chmelevski has six points in his last three games.